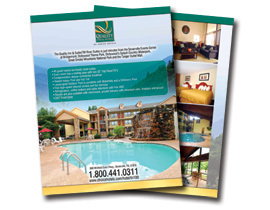 Full Color Flyers are one of the best advertising tools available, and it is one of our specialties. We have an infinite range of options when it comes to the look and design of your full color flyers and we will work with you to make sure you get exactly what you are looking for. Full color flyers are perfect for telling your customers and potential customers about your business, products, and services, and they will help get your messages across to everyone they come in contact with. Full color flyers are a standard part of every day marketing, whether it is to announce a new business opening or offering discounts. If you're looking for a good marketing tool to use to advertise a sale, or even the opening of your business, then color flyers is the best way to go. They don't cost an arm and a leg and they are professional way to spread your message out to the community, or whichever market you are trying to target. You can even get different variations done of the same color flyers to announce different messages or sales you may have going on within your company or business. Full color flyers are one of the best methods you have available today to bring in new business! Printed on our smooth 80# or 100# gloss text paper or on 70# uncoated text. Our Flyers in four colors on both sides (4/4) or on one side (4/0). You may also want to try getting your business cards online along with your marketing campaign to give it the extra boost it needs. They are another great option you have when it comes to putting together an advertisement package to bring in those new customers or clients you have been looking for. For Flyers, please build your print-ready digital files by adding 1/4" bleed to each dimension (or 1/8" bleed on all four sides). For example, a 8.5"x11" flyer with the full bleed should be 8.75"x11.25" and all the text or/and important images needs to be positioned within 1/8" from the edge of the finish piece. Please design your atwork with our templates to ensure proper bleed.